Touch Blue by Cynthia Lord. Grades 4-6. Scholastic Press, August 2010. Reviewed from ARC provided by publisher. Eleven-year-old Tess knows what she wants. She wants to stay on her tiny island home forever and she wants to be a fisherman when she grows up. She wants this plan to work because she can't even think about moving to the mainland and starting all over. The plan? To save their tiny island school from being shut down, island families have agreed to take in foster children. Which is how Aaron comes to live with them. Tess is hoping that Aaron will be like Anne from Anne of Green Gables - a feisty friend ready to explore all the island has to offer. But Aaron's not what Tess expected at all. This is a gem of a book! Tess herself is a feisty character whose mouth gets her into trouble occasionally. She's full to the brim with hopes and wishes and she keeps her lucky pieces around to help her get what she wants. I love how Tess saw the whole foster-kid thing through the books that she'd loved - Anne of Green Gables, Bud Not Buddy, and The Great Gilly Hopkins. Kids who have read any of these books will delight in seeing references to them. What else did I love about this book? The quirky island characters. The details about Maine lobster fishing. Tess's supportive parents. Tess's effervescent personality. In fact, I dare you not to fall in love with this book. Even the cover is perfect - so bright and eye-catching while really fitting with the events in the story. You'll surely want to hand this to fans of Lord's previous book, the Newbery-honor-winning Rules. I'd also hand it to fans of Moxie Maxwell and maybe Clementine (though it's aimed at kids a bit older than your typical Clementine audience). 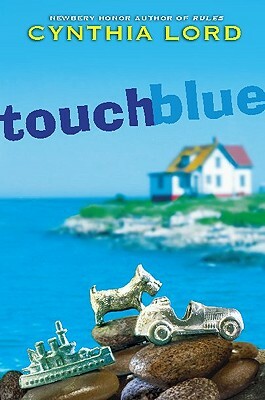 Touch Blue will be out on August 1. I know I'll be paying attention to the Newbery nominees now. It'd be fun if you've predicted correctly! Ooo! New Cynthia Lord! Huzzah!